Compost Tumblers - Easy Composting Tools That Work. Are you confused about which are the best compost tumblers? There are tons of them on the market and some work better than others. Keep the composting area tidy. Produce finished compost more quickly. Here are 3 tumbling composters that make the grade. Each for a different reason. 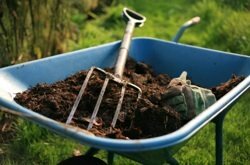 Easy composting tools for going green at home. For easy composting in the back yard the Tumbleweed 200003 Rotating Compost Bin - Green is one of the more popular compost tumblers. A well designed hard worker, the tumbleweed has earned a good reputation in the composting community. Typical Amazon customer comments about the Tumbleweed. "This compost tumbler really works--compost is cooking fast, smells great and the tumbler is a lot tidier than our old open compost heap." This itty bitty composter fits neatly on the porch or patio or even in a storage or mud room. Designed for small families and small spaces this composter comes completely assembled, just take it out of the box and start your composting project. Made primarily from recycled plastic the unit measures 18.5 x 20 inches making it lightweight and easy to turn. Separates the "tea" from the compost keeping the contents at the perfect moisture level while rendering the highly nutritious tea to use for fertilizing plants. Envirocycle Original Composter is the big brother version of this composter and is the answer for bigger families. While still fitting comfortably in the garage or on the patio it has a family sized appetite. "This is the perfect composter for city dwellers like me with virtually no backyard." "I recommend this composter as just perfect." The hands down winner for the coolest compost tumbler is the STC 33301 Green Ecomposter . And it's not just a funky face. The design has eliminated many of the concerns of avid composters. These compost tumblers come ready to assemble and will take 2+ hours to complete. Once assembled, the sturdy, critter resistant unit, stands thigh high without the stand (keep this in mind when assembling the unit indoors). When the unit is half full or more, it will take some effort to turn it although that's true of ANY composter. The finished compost can be rolled right to where you want it, open one of its doors and scoop the contents onto the garden. The neighbors are really going to wonder what you're up to when they see this baby in your yard. "...people have complimented me on my orb sculpture, thinking I bought art." "It is creating great compost, easily." In order for a batch of compost to finish, you must stop adding fresh material to the pile. Many people buy 2 or even 3 composters so that an active pile is always brewing while another finishes. balance of wet and dry ingredients to produce the heat required for proper composting. If you are composting primarily kitchen scraps and don't have access to clippings, leaves or hay, our recommendation is that you use a worm composter. Fruit and vegetable peelings tend to be very moist and without the bulky, drier, yard and garden clippings they tend to produce a too moist mixture that doesn't break down as desired in a garden composter. The most common complaint of users of tumbling composters is leakage, which is a clear indication of a too wet combination.